You have probably already seen that the new layer dialog box is mode-less just like the Properties palette and can be kept open at any time if you want to. Notice though that you might get performance problem if you keep it open, so if things goes slow try to just open it when needed. Having it minimized does not help so close it completely. Of course it can be anchored, docked, auto-hidden and use transparency as any palette. 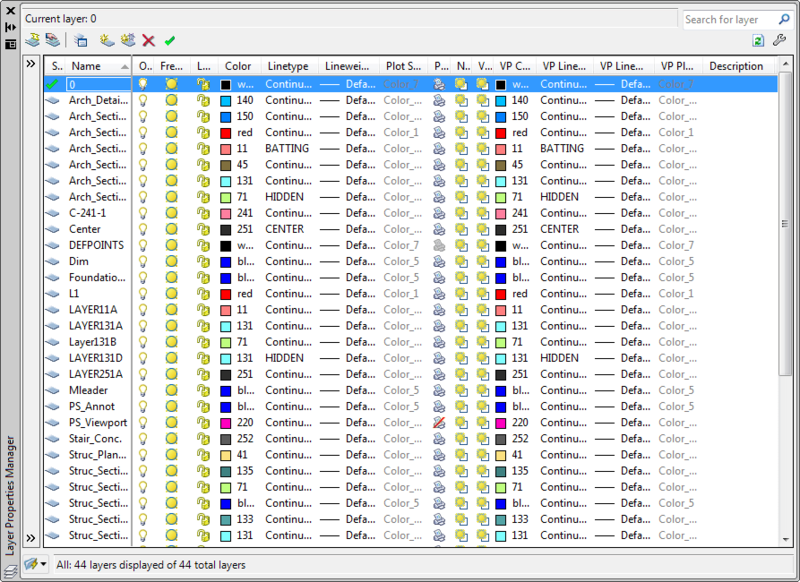 Notice also how the layers are sorted differently in AutoCAD 2009. In previous versions 10 was sorted before 2, 20 before 9 and 02 before 1. Not any longer. Now the sort is as expected. But there are so many columns and it takes up my whole screen you may say. Columns can be customized. Select what columns you want to see or not. Change the column width using the Maximize and Optimize options on one column at a time or on all. You can also freeze/unfreeze a column like in Excel so the columns of your choice always are seen on the left side. Customize Layer Columns dialog box. There is no OK or Apply button so Layer property changes are applied instantly. This can in some case be a performance problem to where you would need to use the old CLASSICLAYER command. When space (Model to Layout or Layout to Viewport) is switched, the enhanced Layer Properties Manager displays the current state of the layer properties and filter selection in the current space. The display of the appropriate additional layout or viewport properties is restored. The enhanced Layer Properties Manager supports dual monitor scenarios. It can be placed on secondary display while drafting on primary display. The dialog box or palette can also be minimized or closed when not needed. The context menu has been expanded to include "Remove Viewport Overrides for" and "Isolate selected layers"
You can now use layer filters in real time. Filter selection is instantly reflected in the drawing session. With the Hide/Show Layer Filters pane button, you can now control the display of the layer filters pane in the Layer Properties Manager. Layer Isolate controls have been added to the Layer Settings dialog box. A new option for combining layer property changes for Undo and Redo operations is accessible from the User Preferences tab of the Options dialog box. If you want to revert to the old LAYER command you can use CLASSICLAYER. LAYERCLOSE Closes Layer Properties Manager. LAYERDLGMODE Sets the flavor of the Layer Properties Manager that will be defined for the use of the LAYER command. The LAYER command is mapped to execute either the CLASSICLAYER or LAYERPALETTE. LAYERMANAGERSTATE Returns value indicating whether the Layer Properties Manager is open or closed.